I hope you enjoy the 150+ podcasts that are in this archives. 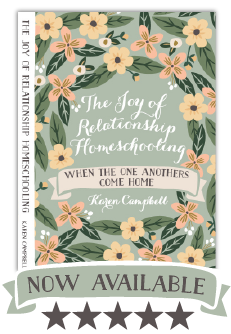 Most of them are devotionals or practical tips that I have written based on my 26 years experience as a homeschooling mom and presented with homeschooling moms in mind. Some of them are podcast series where I have interviewed my guests on a variety of topics that are of particular interest to homeschoolers. My goal is to have a new one each week but sometimes that just doesn’t happen! 4. If you prefer to download to your MP-3 player, click on the i-Tunes logo on the sidebar and you will be taken directly to the site. Also, you can download and listen to these podcasts through iTunes. I am happy for you to burn any of these podcasts to CD’s to share with others and I only ask that you label them with my name and web address before passing them along.